It’s great to get your little one out of the house as much as possible so that you both can enjoy the fresh air and sunshine. Unfortunately, the heat from the warm summer sun may cause your baby to become uncomfortable and fussy at times, especially if you are in an area that doesn’t have much shade. Clip-on stroller fans can help make summer outings more comfortable for baby and more enjoyable for you. There are several portable fans designed for use with strollers that are safe for use around infants and toddlers. If you are unsure about which product is the best stroller fan for your child, check out the details below for the top seven stroller fan products. Dreambaby Stroller Fans attach easily to most strollers or playpens and provide a gentle breeze on hot summer days. The Dreambaby Stroller Fan is one of the best stroller fan products that you can purchase. It features a compact size which makes it easy for you to store it in a diaper bag while on the go. The fan easily clips to your stroller, car seat, or anywhere you want to provide your child with some extra cool air. The blades on this portable fan are made from soft foam material, and it will stop moving if your baby touches it. It also has a flexible neck so that you can adjust to any angle. It operates on 2 AA batteries. Mini 4 inch design, easy to carry, just throw into your bag or use the carabiner to hang. The Dizaul Stroller Fan comes with a portable power bank so that you can keep it charged along with other rechargeable items such as your phone or tablet. This small and lightweight fan is easy to take along on day trips. It is available in various colors and has three adjustable speed settings. The cell lithium battery can operate for 6.5 hours at high speed before it needs to be recharged. It also features a charging indicator light. Using ECO-Friendly Durable&Premium Plastic&EVA Material. This affordable clip-on fan is a great choice for your baby’s stroller. It can be used on practically anything from playpens to car seats. Simply clip it onto any surface and you are ready to go. The fan blades are made of soft and flexible foam so that it won’t hurt your baby’s fingers. And the flexible neck makes it easy to position. It requires 2 AA batteries for use and can also be charged by a USB cable connected to a power bank. The Diono Stroller Fan is a great option because it the cage around the blades are too small for your child to get their fingers inside. This fan easily attaches to any stroller or high chair. It features a flexible neck so that you can adjust the air flow where it needs to be. It is battery operated and requires 2 AA batteries for use. The SkyGeniuss Stroller Fan is perfect for the baby stroller, camping trips, or the office. 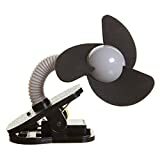 It can be used as a clip-on fan or as a small tabletop fan. The enclosed cage design makes it difficult for tiny fingers to get inside and it can be charged using the included USB cable. It has 2.5 to 6 hours of use on a full charge, depending on the speed used. The Glovion Baby Stroller Fan is small enough to be powered by a 18650-battery, yet it still provides your little one with plenty of cool air while they are spending time outside. It can also be charged by using a USB cable. The fully charged battery can operate for 4 to 6 hours, depending on the speed mode used. The O2COOL Clip Fan is one of the best stroller fan products that you can buy. This lightweight and compact fan can easily be attached to a stroller, car seat or crib. It has a rotating head that can put the flow of air exactly where you need it. 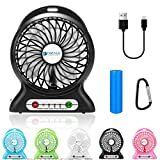 This fan operates on 4 AA batteries that can run continuously on high speed for 11 hours. The fan is also completely silent so the noise will not wake your baby when they nap. 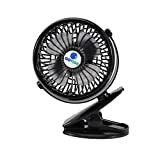 If you have never purchased a stroller fan in the past, then you may be wondering what to look for when it comes to a quality portable fan. The fan case is one of the main things to consider when you are looking for a stroller fan. You don’t want to purchase a fan with a case that has large enough spaces that your child can get their fingers inside. Instead look for one that encloses the blades or look for one that has foam blades that will not injure your child. 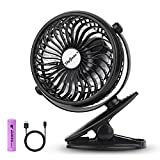 You will also want to find a fan that isn’t noisy. The best stroller fan products will not make a lot of noise that will disturb your child once they fall asleep. A good stroller fan can help to make your time outdoors with your infant or toddler more enjoyable. Be sure to check out these suggestions for portable clip on stroller fans before the temperatures start to heat up.